Jim the Realtor on cnbc – does the advice sound familiar? Hope for Housing? from CNBC. Now that the big investors have virtually stopped buying homes, a legislator wants to find a way to regulate them. Typically the term “institutional investor” refers to private investment firms that buy dozens of residential properties with the explicit aim of generating a steady income stream through rentals. 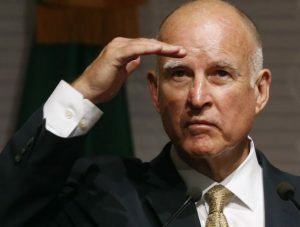 Often they invest the money of wealthy individuals and public pension funds, like those established for California state workers and teachers. The best example is Blackstone, a publicly traded Wall Street firm that barrelled into the country’s single-family home market in the depths of the Great Recession in the late 2000s. Through its residential investment-focused subsidiary, Invitation Homes, Blackstone is now the largest owner of single-family homes nationwide. In California, they own about 13,000 homes. 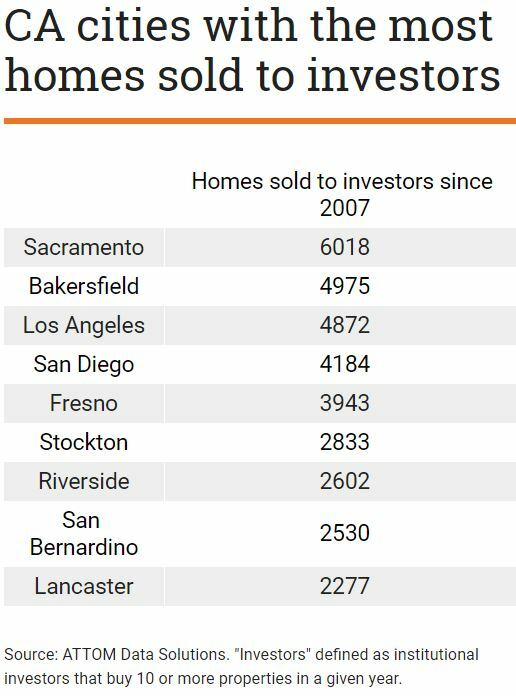 But firms such as Blackstone have stopped buying wide swaths of California homes. According to the real estate data firm ATTOM Data Solutions, which defines institutional investors as entities that buy 10 or more homes in a given year, institutional investors accounted for less than 2 percent of the state’s single-family home and condo sales in 2017. That’s a pretty steep drop from as recently as 2012, when institutional investors accounted for about 7 percent of sales. Why the decline? California no longer has a glut of cheap houses that can be easily gobbled up in foreclosure auctions. A sustained economic recovery and a lack of construction of new housing has sent housing prices skyrocketing. It’s now too expensive for institutional investors to buy lots of California homes. Blackstone’s Invitation Homes bought only 82 California houses last year. Here is a bunch of happy talk by three ivory-tower guys, but they never considered the consequences. Preventing foreclosures and pushing down mortgage rates helped to create a safety net that caused buyers to rush back into the market. Prices went up too quickly, trapping homeowners into their existing homes, rather than being able to move up, down, and around. Now only the affluent can afford a house, rents are skyrocketing, and homelessness is running rampant. The subprime mortgage crisis that broke out a decade ago is widely recalled as an uncontrolled and destructive plunge in housing prices. New research suggests, however, that at least one effort to halt the plunge was in fact quite effective. UCLA Anderson’s Stuart Gabriel, the Federal Reserve Board’s Matteo Iacoviello and Copenhagen Business School’s Chandler Lutz found that California’s 2008 anti-foreclosure law prevented the loss of some $470 billion in home value wealth. The California law, examined against other anti-foreclosure efforts, stands as a potential model for future housing crisis interventions. 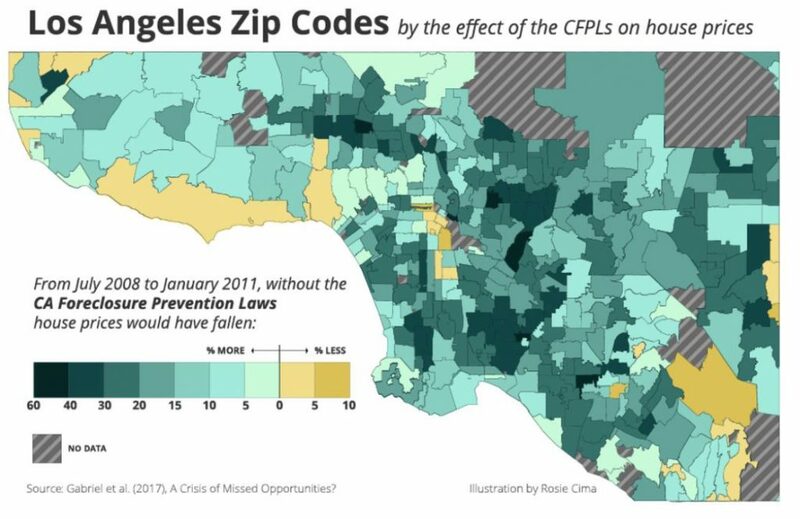 The researchers found that the passage and implementation of the California Foreclosure Prevention Laws (CFPLs) simply and effectively made foreclosures more difficult and more expensive for lenders to initiate, slowing what could have been a more calamitous spiral in housing prices. Limiting foreclosures is key to containing a housing panic. If foreclosures go unchecked in a crisis, they can spread. Because foreclosed-on houses are “priced to sell,” the first wave of foreclosures depresses the prices of all homes in the area. Additional borrowers who can’t make their payments then cannot sell without taking a loss, causing a second wave of foreclosures, further depressing prices. And a downward spiral has begun. A wave of foreclosures seems to also produce a “disamenity effect”: someone who defaults on her mortgage slacks on maintaining the house, and its appearance of disrepair drags down the desirability of the neighborhood. 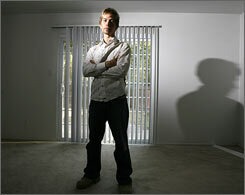 In some states, the law requires that lenders process foreclosures in state courts. Judicial foreclosure laws result in foreclosures costing much more time and money than they do in states like California, which does not have judicial foreclosure laws. The upside to not having judicial foreclosure laws is efficiency — for both the lenders and the government. The downside is that, following market shocks, foreclosures are in danger of spiraling out of control, as they seemed to be in California in 2008. 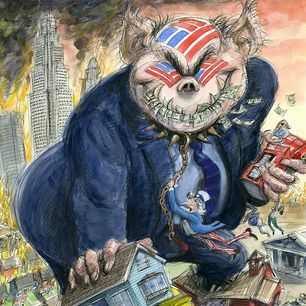 In the midst of the crisis, hundreds of thousands of people lost their homes to foreclosure, and it emerged that banks were “robo signing” on the procedural documents: They were pushing foreclosures through at an unreasonable rate, often without justification or authority to do so. In 2008, California state senator Don Perata of Oakland authored SB-1137, the first of the California Foreclosure Prevention Laws. SB-1137, and the 2009 California Foreclosure Prevention Act after it, both increased the time and the monetary cost of foreclosing on property in California. “The mortgage crisis is taking a terrible toll on Oakland and the rest of California,” said Perata, as quoted in the SB-1137 analysis. “It is crucial that we give homeowners the tools they need to avoid foreclosure when possible because that’s the best outcome for everybody.” Gabriel, Lutz and Iacoviello’s research suggests these laws saved the state hundreds of billions of dollars. It’s been well-documented that Ben Bernanke and others told mortgage lenders in 2011 to not do anything to disrupt the economy, which was gov-speak for lay off the foreclosures. 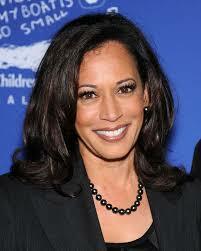 Kamala Harris virtually outlawed foreclosures in California with the Homeowners’ Bill of Rights. Lenders now have to offer a loan modification first to anyone in default, and it seems that you have to really not want your house to get foreclosed these days. 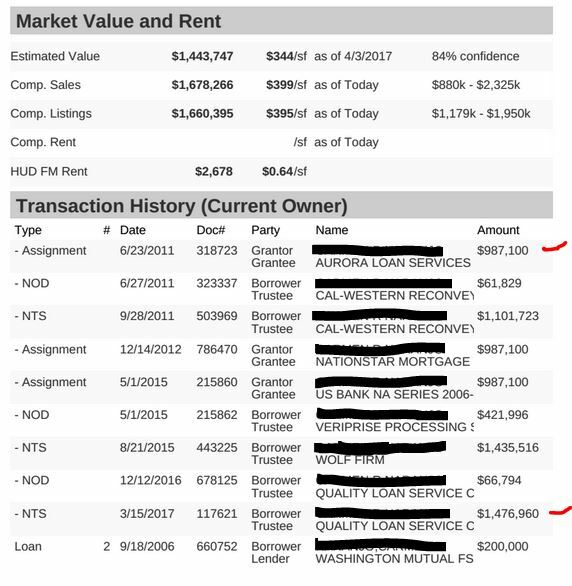 Here’s a borrower who has been in foreclosure since 2011, and by the looks of how the loan balance has risen, the neg-am has been accuring AND they haven’t made a payment. The balance on the first mortgage has gone up $489,860! I just received notice that the foreclosure process just got CANCELLED too. Either the lender gave him a loan-mod, or they gave up altogether? The lenders might foreclose if there is enough equity that they won’t lose money. If it’s close, they let it ride, and hope some payments trickle in. The national foreclosure inventory – the number of loans in the foreclosure process – fell 29.6 percent year over year in August 2016, according to the latest CoreLogic Foreclosure Report. 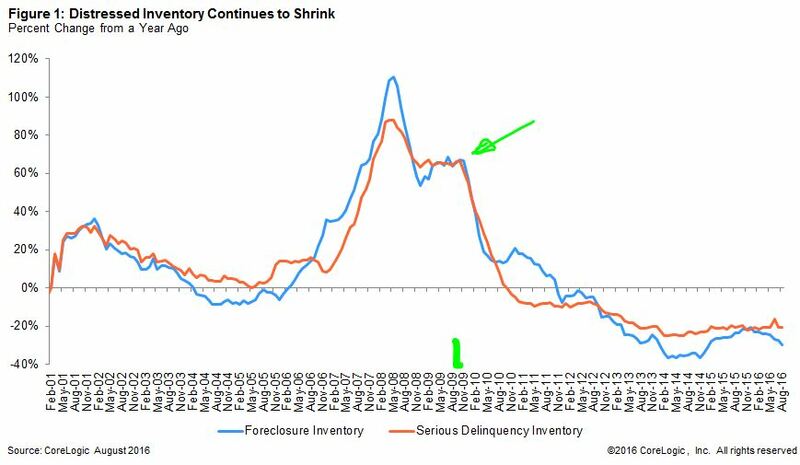 The foreclosure inventory has fallen on a year-over-year basis every month since November 2011 (Figure 1), and in August 2016 it was 77.5 percent below the January 2011 peak. The foreclosure rate – the share of all loans in the foreclosure process – fell to 0.9 percent in August 2016, down from 1.3 percent in August 2015. While the foreclosure rate is back to 2007 levels, it is still above the pre-housing-crisis average foreclosure rate of 0.6 percent between 2000 and 2006. 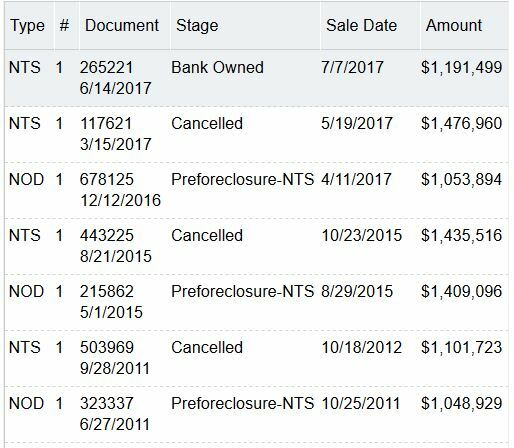 But it still bugs me that NONE of the national real estate players or national media ever questions how or why foreclosures stopped. After 2+ years of 60% or more growth of foreclosures AND serious delinquencies, all of a sudden BOTH dropped off a cliff at the end of 2009. Nevada’s distressed home loans are still caught in economic quicksand, but not for lack of trying to combat banker haste with consumer-oriented ideas. The National Council of La Raza (NCLR), for example, has invested significant donor funds in efforts to bail out underwater borrowers when banks won’t negotiate fairly. “You want to keep families in place if possible, so foreclosure is the absolute last choice that we want, if we’re involved in the transaction,” NCLR Vice President for Housing and Community Development Lot Diaz told ThinkProgress. Diaz’s colleagues at an affiliated non-profit called Hogar Hispano purchase distressed mortgages and then return the homes to the owners at a fair market price that restores their chances of building up equity in the property. Hogar Hispano did 463 of these distressed debt acquisitions in 2013 alone, and saw a favorable outcome for the original homeowner in 316 of those cases. The whole mess just got swept under the carpet, which gave the insiders a fantastic opportunity to profit! What a country! Homes that were foreclosed back in the day have been re-selling – and someone you know just happens to have an extensive video library! 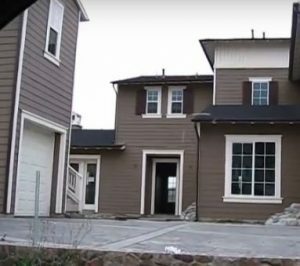 The original purchase price for this McMansion in Chula Vista was $1,301,500 in 2007, but got foreclosed 20 months later. The bank listed it for $585,900, and it closed for $630,000 in March, 2009.